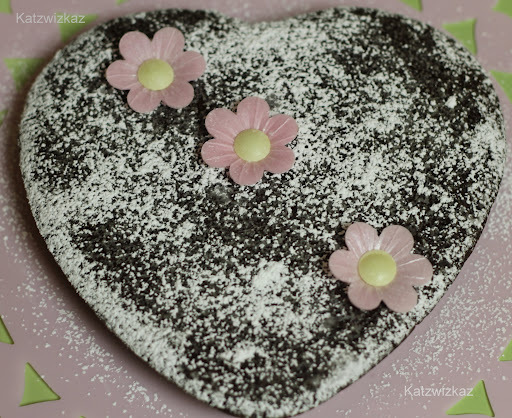 Chocolate Cake = Cake for St. Valentine’s day. Agreed? Add some Potatoes to the mix…….yes, potatoes, and it makes for a very luscious cake indeed. We use Carrots and Courgettes (Zucchini) in cake mixes, so why not potatoes? Used instead of flour, it can be incorporated as the basis for a really good cake (or cupcake) batter. Intrigued? So was I, until I tried it myself. Here is my adaptation of various recipes which I have come across using potatoes. Butter and flour (GF flour) a baking tin. A shallow tin is best, as there is no raising agent in this cake. 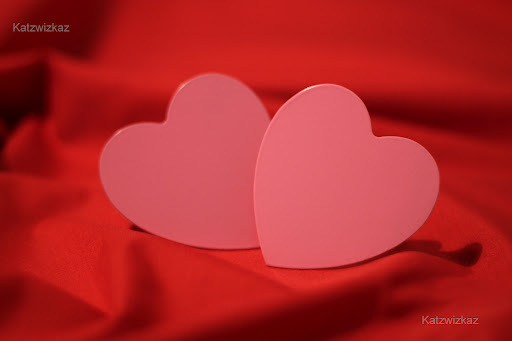 I used a heart shaped tin, which, at the widest point measured 8″ across, and 1″ deep. *I used the Rooster variety. You can use whatever floury potato is available where you are. Don’t use a waxy variety. Peel and boil the potatoes, mash them and set aside to cool. A potato ricer is a useful gadget to have, as it ensures no lumps. Melt the chocolate over a pot of simmering water, and stir this through the mashed potato. In your food mixer, cream the egg yolks and sugar together. Then add the vanilla, coffee, and sift in the cocoa powder. Using a wooden spoon, mix these together. Add this to the mashed potato, and mix again, until fully combined. Next, whisk up the egg whites until stiff peaks have formed. Add one third of the egg whites to the mashed potato mix, and fold in gently. Then fold in the remainder. 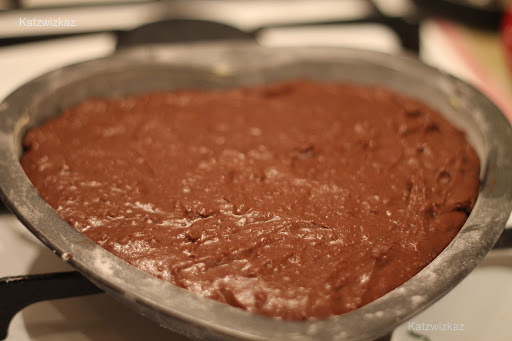 Place the mixture into your baking tin, and bake for 30 minutes until cooked through. The texture of the cake is that of a Chocolate Truffle, and tastes as if dark chocolate was used, and not Milk Chocolate as per the recipe. Decorate as you wish, and serve with whipped cream. My mother made a cake with potato years ago – only remembered it now and from what I can remember it was very moist! After all it is a starch….. Your chocolate cake sounds amazing!I just found your blog and I loved it! Am a happy follower now! Visit me at: my-greek-cooking.blogspot.comHope to c u around! Indeed it is, Maggie, and you can't taste the potato in it at all. Thank you very much for your comment, Elpiniki, just followed yours to, and will add it to my blogroll. Yes, exactly the same idea, Magda. A potato ricer is like a large version of a garlic press, but a fork will do also. Cute cute potato cake indeed. We have a cheesy potato scone recipe that calls for raw grated potato and it produces a lovely moist scone too. Love getting the veg into the sweets for the kids. Aw, thank you, Móna, it was certainly a surprise for me, and a great addition to a cake, or, indeed a scone. Will be hunting down more potato recipes! Potatoes you say? Mama mia…….but the result I can see is amazing…..pretty too…. Thank you for your comment, Catríona. You cannot taste the potato whatsoever! Lots of folks see potato and think it will be awful, but it's really moist and very surprising.